The crowns of your teeth are the parts that appear above the gumline. They help to protect the rest of the structure from the different foods and bacteria that enter and circulate in the mouth throughout the day. If their damaged, then, it’s imperative to restore them with dental crowns in San Antonio. Read on to learn what happens when damaged crowns aren’t addressed. What is the Crown Protecting? Dentin – Lying just beneath the enamel, the dentin is the part of the tooth where nerves are found. Pulp – The next layer is the pulp. This is the nerve epicenter of the tooth and also contains the canals. When a crown is not restored, these sensitive areas are left exposed to a barrage of attacks. What Can Happen if the Crown isn’t Restored? Toothache – Once bacteria get on the move, they don’t stop unless something is done to rid the infected area of them. Thus, an exposed tooth allows them to penetrate and release their caustic substances, which can lead to a painful toothache. Gum Disease – As the infection travels, the gums can eventually be compromised. As a result, you may notice irritation, bleeding, swelling and puffiness in your soft tissue, which are signs of gum disease. Gum Recession – Over time, your infected gums will start to retract, leaving your teeth roots exposed and more susceptible to infection. Tooth Loss – If untreated, the infection can eventually result in tooth loss, a result of the shrinkage of the soft tissue that holds your digits in place. Thankfully, the above problems can be prevented by visiting your dentist in San Antonio for a crown restoration. The process is simple and only takes two visits to complete. Preparation – For your new crown to fit properly, your dentist may have to shape your current tooth. 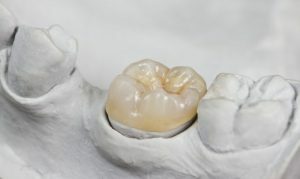 Bite Impression – The next step is to take a bite impression that will be used to fabricate the permanent prosthetic. Provisional Crown – The measurements will be sent to a trusted lab that will create your permanent crown. Meanwhile, you’ll be fitted with a temporary fixture to protect you from infection. Final Fitting – When your restoration is ready, you’ll be invited back to your dentist’s office to be fitted, and you’ll leave with a fully functional and aesthetically appealing new smile. If your crown has been damaged, you can be restored fast by taking proactive measures to get the help you need. Reach out to your local professional to schedule a consultation today. For nearly 30 years, Dr. Troy Jones has been providing top-notch care to his patients. A graduate of the University of Texas Health Science Center at San Antonio, he’s still just as passionate about helping his patients experience the absolute best in oral health as he was when he first entered the dental field. Dr. Jones restores damaged crowns at Jones & Knight and can be reached for more information through his website.